Hello, I’m Tom Theed and I’m the Rural Estates Delivery Advisor in the South West for Landmarc Support Services. We are contracted to manage the Defence training estate on behalf of the Defence Infrastructure Organisation. I am often asked why it’s necessary to fell so many trees in the autumn; why can’t we just let nature look after itself. The answer is surprisingly complex. Since the end of the last Ice age, about 12,000 years ago Britain has been largely covered by trees, a vast mosaic of wild woodland that would have ebbed and flowed across the landscape and supported a diverse range of flora and fauna. As early as 8,000 years ago trees and woodlands were being managed for fuel and building materials. As agriculture and population developed, the woodlands were cleared and became fragmented, and by the end of the 19th Century woodland cover in the UK was as low as 5% of the land surface. Now woodland cover in the UK is back up to around 13%, but still lower than the rest of Europe. Almost all of it is planted and managed, not the natural wildwood it once was. 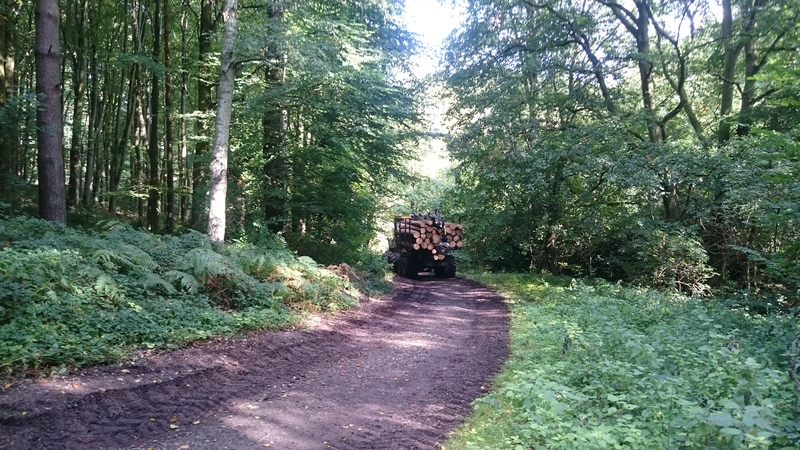 Modern forestry is largely a commercial enterprise, with the woodlands managed like any crop. But unlike growing corn for cornflakes the timescale for a timber crop can be anything from 30 to 100+ years. Over that time the plantation will regularly provide timber products as it is thinned out to improve the quality of the final crop. As well as providing a home to wildlife, the changing shape of a plantation provides different habitat opportunities for many different species. In order to limit the disturbance to this wildlife, most tree felling is undertaken in the autumn and winter, outside the bird nesting season and after the trees and other plants have set seed or borne fruit. This is essentially why we cut trees down at this time of year. All forestry operations on the Defence Training Estate are managed by Landmarc on behalf of the Ministry of Defence. 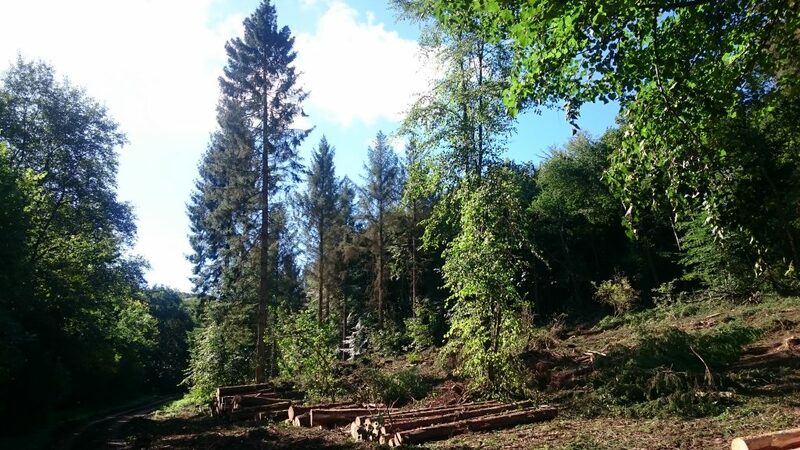 In the case of our recent work at Erlestoke Wood on Salisbury Plain we have been felling the Spruce trees. This was done for two reasons: Firstly these trees were planted as a commercial crop in 1958, and it’s time to harvest them. Also, the Green Spruce Aphid (Elatobium abietinum) has been responsible for the rapid decline and death of these trees, so we’ve had to act before the value of the whole crop is lost. Luckily the other trees in the wood are unaffected. 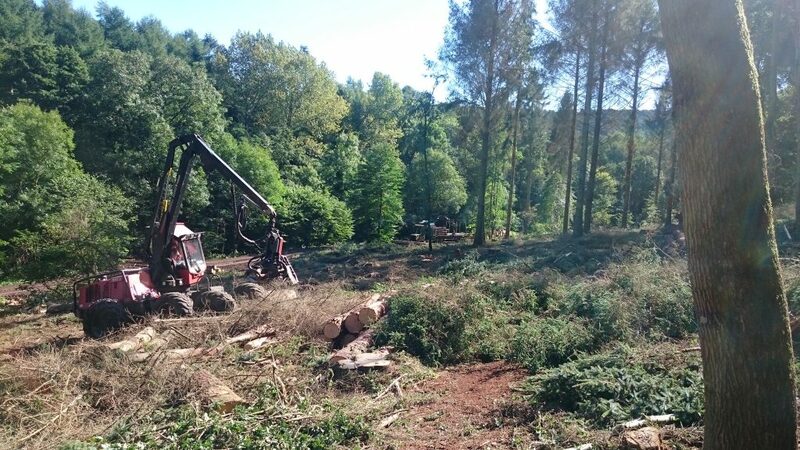 I can understand people’s concern, especially when they see the harvester (a large purpose-built machine that fells and processes the trees) and the sudden change in the wood’s appearance that it brings. But this is essential forest management and for obvious safety reasons we had to close some sections of the woods for short periods. I’ve been involved in woodland management for over 20 years and it always amazes me to see how quickly a clear-felled area recovers. The churning of the topsoil by the machines opens up the seed-bank and the increase in sunlight reaching the ground means that seeds which may have lain dormant for years suddenly germinate. In order to help speed up the regeneration of the woodland, we will be planting trees as well. There will be a mixture of broadleaf species including Oaks, Maples, Beech and Hornbeam along with Pines, Firs and Yew. There will also be Rowan, Crab Apple and Cherry along with scrub species such as Spindle, Hazel and Guelder Rose. In total there will be about 3,600 new trees. These will already be two to three years old and planted in tree tubes to protect them from deer. The reason for such a varied crop is partly to create a more ‘natural’ woodland, but more importantly it is to ensure the woodland is much more resilient to pests and diseases in the future – a rapidly growing concern for foresters, with the most recent issue being Chalara Ash Die-Back. 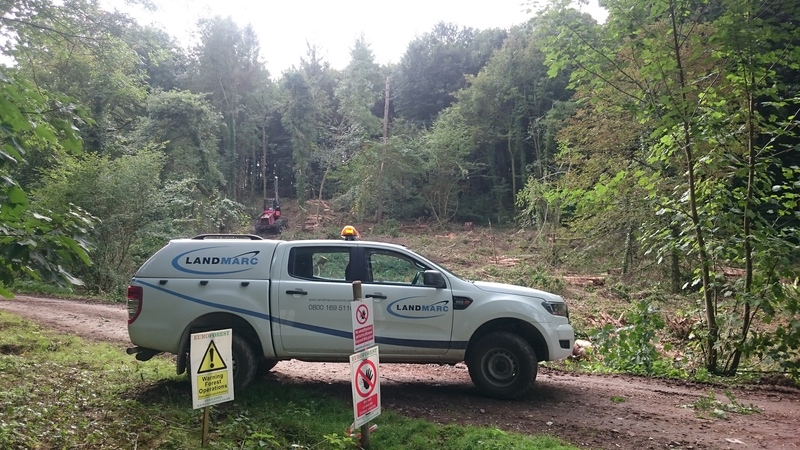 So while there is always some short term loss when undertaking any woodland management, there is usually a substantial longer term gain. We also have other major plans for Erlestoke Wood, including the sympathetic restoration of the historic ornamental pond system and network of paths. We will be applying for funding from a number of sources shortly to enable us to complete some of this work and make even more of the woodland accessible.